Pounding shots, chain-smoking cigarettes and stuffing your face with burritos are usually late-night activities, and for multiple good reasons: You have a job to do; you have kids to look after; you have an ailing relative to care for. Whatever it is, it’s not getting done if you’re blitzed out of your mind (or inviting a food coma) by 9 a.m. 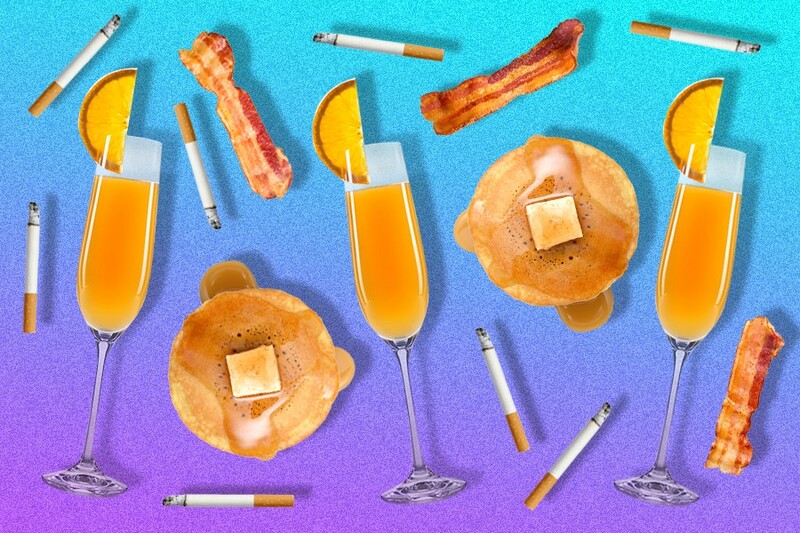 But here’s a thought: Your actual responsibilities aside, wouldn’t your body be better equipped to deal with booze, nicotine and unhealthy eats in the morning, when it’s got the rest of the day to process them? According to the experts we spoke to, it all depends on your vice of choice. White also mentions that your energy levels, ability to focus and metabolism are all at their highest earlier in the day. As a result, you’ll probably be less of a sloppy drunk. Similarly, this might explain why you feel the effects of pounding beers and toking joints more so in the morning than you would at night — you’re more alert and aware of the effect they’re having on you. Once again, though, consuming alcohol — especially in excess — early in the day will have profoundly negative effects on your ability to be a contributing member of society. Sooo… pros and cons? According to a recent pair of studies, smokers who light up first thing in the morning are more likely to develop lung cancer and tumors of the head and neck, compared to those who wait at least an hour after rolling out of bed to smoke. The reasoning is still unclear, but the researchers hypothesized that people who smoke earlier in the day may simply be more addicted, and therefore, smoke more in general. “These smokers have higher levels of nicotine and possibly other tobacco toxins in their body, and they may be more addicted than smokers who refrain from smoking for a half hour or more,” said lead researcher Joshua Muscat of the Penn State College of Medicine in a statement. Bottom line: If you smoke a lot, you’re basically fucked whatever time of day you light up. Researchers from the University of Alabama at Birmingham recently discovered that foods high in saturated fats — like burgers, sausages and fried foods — are better for you (well, less bad for you, at least) if you eat them early in the morning, rather than late at night. To reach this conclusion, the researchers fed two groups of mice the same number of calories each day, but one group was given a fatty breakfast and a lean dinner, while the other was served a lean breakfast and a fatty dinner. At the end of the study, the mice who ate fatty foods for breakfast had normal metabolisms, while the mice that had an unhealthy dinner showed symptoms of metabolic syndrome, which according to the American Heart Association, increases the risk of obesity, type-2 diabetes and high blood pressure. This was no one-off, either: Another study out of Texas A&M University found nearly identical results. But why is chowing down in the morning better for your body? “Our gastrointestinal tract and the pancreatic and digestive enzymes our body produces are designed to digest food during the day, when we’re able to quickly burn them off by moving about,” explains dietitian Liz Weinandy. Stuffing your face with saturated fats late at night also messes with your internal clock, exacerbating the body’s inflammatory response (that is, swelling of the tissues) to greasy grub — a response that can increase your risk of metabolic syndrome as well. For that reason, we officially crown piles of grilled meat the breakfast of champions.